Melba N. Cañet who will turn 65 tomorrow will finally leave the portal of education as she retires from the service as district I supervisor in the division of La Carlota City. Teachers and school heads of district I comprising the schools of Ayungon, Balabag, Batuan, Caiñaman, CAC Malipayon, La Carlota South 1, and Ferlou tendered her a fond farewell rites this afternoon. They gave her a tribute in a form of entertainment like songs and dance, poem reading, impressions. 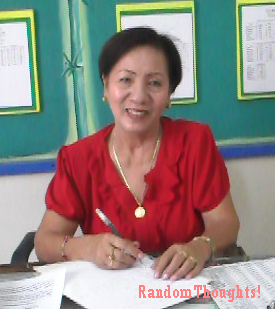 Araceli Discaya, Grade IV teacher of La Carlota South ES I described Ma'm Cañet in her impression as fashionable woman, very punctual in coming to office, approachable, and very understanding kind of supervisor. While La Carlota Assistant Schools Division Superintendent Ferdinand S. Sy praised Ma'm Cañet as a "well-loved" school administrator as manifested by the 100 per cent of attendance of teachers in her district in her farewell party. "Looking at her," Sy said, "she's not 65 years old, but 26 years old." This is because her life is well-spent in the service. She has the charm and the ability to make people smile, the ability to connect with people. She's not only an educator, but all-around person to take care of you. Retiring from the service does not mean to rest in peace. It's a challenge since the DepEd doors are closed, but more windows are opened. Ma'm Cañet possesses a mixture of beauty that comes from within and wits to learn something from her, concluded Sy. Cañet responded by recalling her memorable experiences and how she rose from Classroom teacher to a school principal and to a district supervisor. She lengthily expounded her teaching and administration covenant. She said she was very happy for she made the point to work, work and work! "That's the way I used to be," she quipped everybody roared in laughing. She was a "binder of wounds", a "cataclyst for change". "Kung walang aura. Walang pera," she said everybody thundered laughing. "I am the happiest mother, a teacher, a friend, and a supervisor," she said about to conclude. Then she sang a line, "a million thanks to you, my love!" She is indeed a rare species. Moments like saying adieu start tears to fall, but in her, we rolled in laughter as she delivers her farewell message. Tnx Sir Gil for posting every important activity we have in our division. Don't mention it. I'm already used to do this for no personal gain. For I know this is one way of making our division known to every nook of the world, that it exists. It's alive and kicking. And that we've our own unique way of making things happen "the way they used to be."